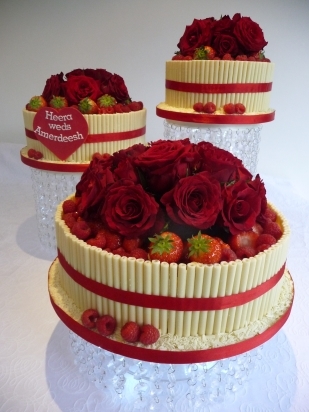 Chocolate wedding cakes are increasingly popular. Your chocolate cake can be covered with fondant icing, chocolate ganache, chocolate fondant icing or chocolate cigarellos and decorated with sugar flowers or chocolate flowers. Many couples choose to serve their chocolate wedding cake as dessert. The costs of a wedding are increasing all the time and this helps to keep your costs down. Chocolate can be white, milk or dark and whatever you choose your chocolate cake will be made from the finest quality continental chocolate. With 15 years of baking experience, Fancy Cakes by Rachel specialises in bespoke Wedding cakes and celebration cakes for all of your special occasions. To see some of our chocolate wedding cakes have a look in the galleries. Just give us a ring on 07710 512 356 to discuss your ideas and arrange a free, no-obligation consultation and informal chat. Or, use the Contact link to send us a short e-mail with your telephone number and a brief description of what you are looking for, and we will call you back.